The Northshire Poetry Reading Group will meet on Thursday May 23rd at 6pm in the bookstore conference room for a discussion of One with Others by C.D. Wright. C.D. Wright , Rising, Falling, Hovering. C. D. Wright's book The Art of Losing was available from LibraryThing Early Reviewers. 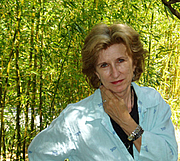 C. D. Wright is currently considered a "single author." If one or more works are by a distinct, homonymous authors, go ahead and split the author. C. D. Wright is composed of 1 name.